Bird owners must constantly be on the lookout for signs that their pets are becoming ill. Even the most subtle symptoms can be "red flags" that their pet is in dire need of veterinary treatment. Because illnesses can be such a serious issue for pet birds, it is important to become familiar with the most troublesome health problems that can arise in our feathered friends. Take a look at the bird health problems outlined below to learn more about some of the biggest bird health problems that could possibly affect your pet. Increasing your knowledge of bird health problems will help you to recognize any issues early on, and offer your bird prompt treatment and the chance for a swift recovery. Several years ago, cases of avian flu made the news around the world, and recently they have again been popping up in the headlines. While most of the cases focused on involve birds that are raised as food, pet bird owners should know that avian flu can affect birds of any species -- meaning that parrots and other commonly kept pet birds are also at risk of contracting it if exposed. 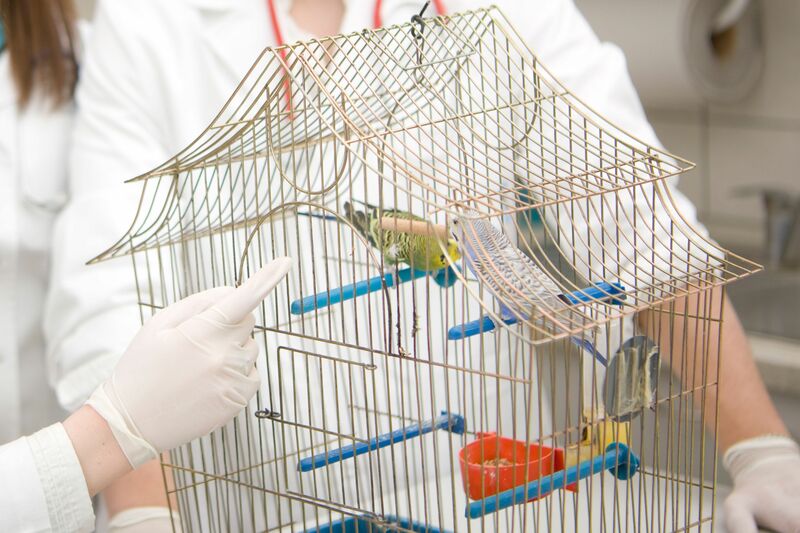 While the risk of exposure to captive pets is considered minimal, there are things that can be done to further protect your feathered friend from this deadly pathogen. Check out this article on avian flu for more information. Parasites can affect any animal, including birds and humans. It is important to monitor your pet bird for any signs of internal or external parasite infestations as children, other pets, and other family members can also contract them if exposed. Certain parasites can be deadly to pet birds if not treated quickly, so learning as much as you can about their signs, symptoms, and risks of exposure is imperative to protecting your pet and family. Learn all about the most common types of parasites that can affect pet birds in this article on parasite infestations. One health problem that strikes fear into the hearts of bird owners is Psittacine Beak and Feather Disease, also known as "PBFD." It is a deadly virus that causes abnormal beak and feather growth, lesions, and various other problems. PBFD can affect any parrot species, and there is currently no known treatment or cure. To make matters worse, PBFD is highly contagious, and can quickly spread throughout an entire flock of birds who are kept in close quarters. It is important to learn about the signs of PBFD in order to prevent the spread of this devastating illness to other birds that may be owned by you or your friends and family. Those who own male birds can breathe easy here -- egg binding is a condition that can only affect female birds of breeding age. Egg binding is a very serious problem and can cause death in affected birds if it is not promptly treated by an experienced avian vet, so it is important for those who own female birds to become familiar with the signs and symptoms of egg binding so that they can recognize any problems early enough to save their pets. Pretty much every adult alive knows what stress is, but many don't realize that stress can also affect parrots and other pet birds, and just as it does in humans, it can cause a decline in immune response and make a bird more susceptible to other illnesses. While they are subtle, there are several different signs that bird owners can watch for so that they can identify stress in their birds and prevent the onset of more serious issues. Read this article on stress in pet birds to learn about what can cause stress in your feathered friend and what you can do to reverse it if it has become a problem.